If you have moved to London for four weeks, your son has fallen sick on the first night, but thankfully, two doctor occurences and five days later he can actually hold some food in, the sun is shining and spring is in the air, and to top it all, it is a Sunday which happens to be the (British) Mother’s Day, do no more than head to Tom’s Delicatessen for breakfast. And even if you’re lucky enough to escape the context we had by today, I can still recommend the place. 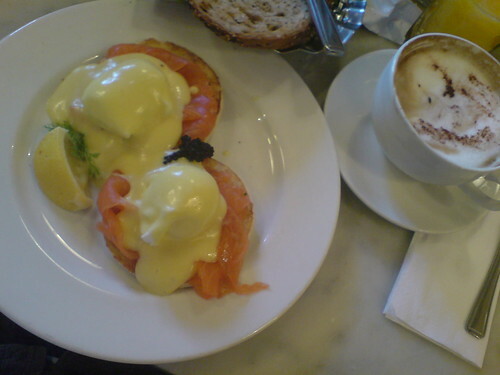 Get a fresh juice, one of their excellent coffees and, if you are not the full English breakfast type, Eggs Royale with salmon and caviar (pictured above). Googling around I’ve found people calling this the best breakfast in Notting Hill. Have to agree, even if I haven’t had many out here. And, they are extemely kid friendly. By the way, they say that Tom is the son of Terrence Conran. And what a talented, but down to earth gourmet son he is then. See more of his places to eat.